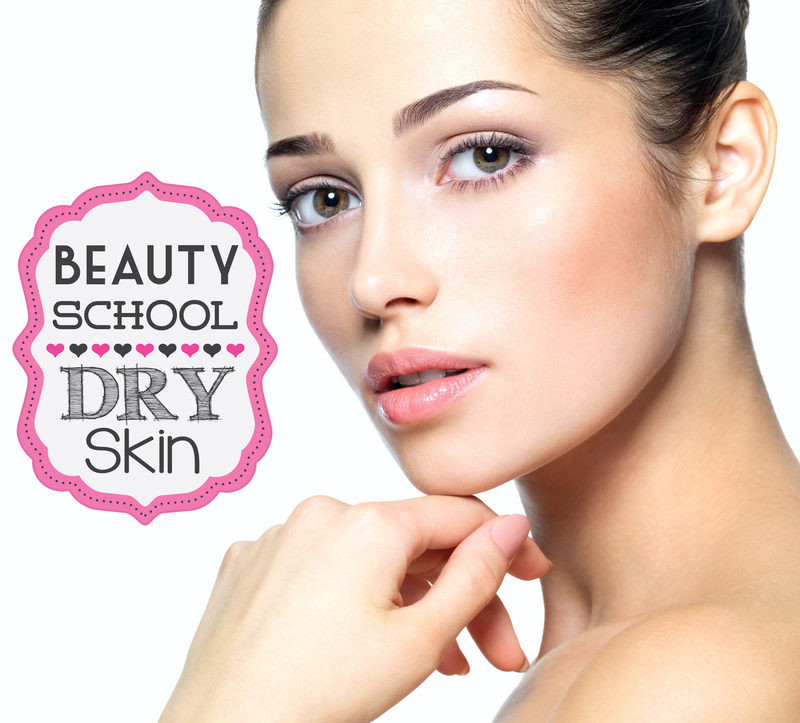 Today we’ll be learning a bit more about dry skin, this is my fourth blog post in my ‘Beauty School’ series for skin types. To learn more about this new series , head over here. Click here to check out my blog post on oily skin, and to learn more about sensitive skin, click here. If you have combination skin and would like to learn more about the causes, skincare and makeup tips – then click here. There are 5 basic skin types: oily (we’ve already covered this one), normal, combination (covered this one in my last ‘Beauty School’ blog post), sensitive (we’ve also covered this one) and dry. Your skin type is determined by how much (or how little) oil your skin produces. Genes, stress levels, diet, hormonal fluctuations, medication and even your current skincare regimen all have an effect on how much oil your skin produces. As mentioned in my other blog posts there’s a quick test you can do to determine which skin type you have: Cleanse your face at night but don’t apply any skin care products after cleansing the skin (no toners, serums, moisturisers, eye creams) and make sure you sleep without air-conditioning on. When you wake up in the morning, pat your face with a tissue, the result will tell you which skin type you have. If you have dry skin, the tissue will show no sign of oil spots. The most likely reason for tight, flaky skin is a damaged protective barrier. Your skin’s outermost layer, is made up of overlapping dead cells (almost like the tiles on a roof) that seal moisture into the skin. Hot water, cold, dry air or harsh cleansers and scrubs can cause this outer layer to break down. The result? Skin loses the moisture it needs to stay supple, leading to dry & damaged skin. Hormones also play a role, since they determine the amount of sebum (oil) your skin produces. Which is why skin tends to get drier after menopause. Hypothyroidism (underactive thyroid) can also cause dry, flaking skin. On the upside – if you have a parched complexion, you are not plagued with a shiny T-zone. This means you tend to have fewer breakouts and smaller pores – lucky you! ♥ Look for products that contain humectants (ingredients that attract moisture from the environment to your skin) like Glycerin and Hyaluronic Acid (take a look at my short review on the Indeed Labs Hydraluron Moisture Booster here). Also look for occlusive ingredients like oils that will seal in moisture i.e. avocado, rosehip and hazelnut oils. ♥ Hot water robs skin of moisture causing dry skin – wash your face with lukewarm water (or even cold water in the hot Summer months). ♥ Incorporate a cleansing oil or cleansing balm into your skincare routine. You can either use it as a first step in your double cleansing routine or you can oil cleanse your skin in one go (and not follow up with a cleanser). I’ll be doing a more in-depth blog post on oil cleansing in the next couple of weeks, so won’t go into more detail now. ♥ Soaps (especially those containing Sodium Laurel Sulfate) can be drying, so stick with a creamy moisturising cleanser specially formulated for dry skin. ♥ Exfoliate with a cream-based exfoliator once a week to get rid of dry, flaky skin. Over-exfoliating will dry out the skin, so once a week is sufficient. ♥ Try to stay away from a chemical exfoliant i.e. containing Glycolic / Lactic Acid as this might irritate dry. sensitive skin. ♥ Use an alcohol-free toner & avoid using astringents or toners that have Retinols, Glycolics, Or Benzoyl Peroxide in them as these will be way too drying and may even cause the skin to breakout. Look for a toner that is water-based and has ingredients like rosewater or chamomile extracts, and vitamin B derivatives (i.e. Panthenol), which help to lock in moisture. ♥ Add a hydrating serum that contains anti-oxidants to your skincare routine, this will do wonders for your skin. Remember, serum first and follow up with a moisturiser. ♥ Ever noticed how the parts of your body that are not routinely exposed to the sun are rarely, if ever, dry? Take a look at the inside part of your arm for example, that’s because areas with little to no sun damage don’t suffer the range of problems that originate from constant sun exposure. Sun damage slowly makes your skin less and less able to hold moisture. ♥ Apply moisturiser when skin is still slightly damp, it helps to seal in hydration and allows your moisturiser to penetrate fully. Moisturisers should be filled to the brim with antioxidants, ingredients that help skin hold on to water, skin-repairing ingredients, and anti-inflammatory ingredients. ♥ Use facial oils and creams, which are richer than lotions (lotions are lighter than a moisturiser and more suited for oily or combo skin). ♥ The eye area (especially under eye area) tends to be the most dehydrated area on the face, invest in a thick eye cream. ♥ If you have very dry skin, sleep with a humidifier in your room at night. ♥ Eat plenty of hydrating foods (veggies and fruit) and add an Omega-3 supplement to your diet, which helps to repair your skin’s lipid barrier. ♥ As mentioned in this blog post, drinking 8 glasses of water won’t really do much for hydrating the skin as the water you drink usually goes to all your internal organs first. I’m not saying DON’T drink water – a combination of drinking lots of water, incorporating healthy fruit & veggies and taking an Omega-3 supplement will definitely benefit your skin. ♥ Apply a small amount extra virgin coconut oil on your freshly cleansed face at night and massage into the skin. This is one of the most natural ways to moisturise the skin. ♥ Remove dry skin flakes from your lips by gently buffing them off with a soft toothbrush or using a lip scrub. Follow up with a generous amount of an intensely moisturizing lip balm, preferably one with natural waxes and plant oils. ♥ Slather on a hydrating primer before applying your foundation, to plump the skin up as much as possible. A good primer will prep the skin and infuse it with moisture, making it difficult for foundation to cake up. ♥ Wait a couple of minutes for your skin to absorb the hydrating ingredients of your primer. ♥ Add a healthy, hydrated glow by applying a cream / liquid pearly highlighter underneath foundation. Dab it onto the tops of the cheekbones, down the bridge of the nose and lightly across the forehead, and blend with a fluffy synthetic brush. ♥ Anti-aging foundations tend to be more hydrating & boosts collagen. Oil-free foundations won’t work on dry skin, so look for a rich formulation instead such as a cream, liquid or even stick-form foundations. ♥ If you don’t need a lot of coverage, try a tinted moisturiser or BB cream. Remember, though, a tinted moisturiser does NOT replace a regular moisturiser. ♥ Always apply a creamy under eye concealer. If you notice creasing, set it with a light dusting of translucent powder. ♥ If you have dry skin, you won’t need to set your makeup with a powder. ♥ Pick a powder bronzer with a tiny bit of shimmer, this will give dull, dry skin a healthy bronzed glow. Apply the bronzer using a large, fluffy brush to the perimeters of the face & where the sun would naturally kiss your face i.e. forehead, the tip of your nose and chin. Sweep what’s left on the brush over your neck so it all blends in evenly. ♥ Cream blushes are a must for dry skin. Yes, powder blushes last longer but a cream blush will give you the flushed dewy cheeks you’re after. Get the best of both worlds by applying a cream blush to the apples of the cheeks and set with a light dusting of a powder blush in a similar shade. ♥ Use a brow gel, brow mousse or brow pencil rather than a brow powder. ♥ Choose creamy eyeshadows as you can effortlessly wear these products without having to worry about creasing. Your eye makeup is not likely to smudge either, given the absence of excess oils in the area – so revel in the assortment of products (cream, liquid, mousse, gel, powder) you can choose from. ♥ No matte or long-wearing formulas for dry lips, please. Matte lipsticks accentuate texture (flaky skin) on the lips, so rather opt for a super creamy lipstick or a gloss. For added moisture, apply a moisturising lip balm under your favourite lipstick. ♥ Fake dewy skin by setting your makeup with a hydrating makeup setting spray specially formulated for dry skin, as it will hydrate dry areas and give a softer, smoother appearance to your makeup. ♥ Carry a hydrating facial mist (like the Uriage Thermal Water) with you when you’re travelling to less humid areas & keep a bottle on your desk to hydrate your skin in Winter, when heaters dry out the air. Tomorrow I’ll be loading the MIY homemade facial mask recipe for dry skin, so keep those eyes peeled for that! I hope you are having a lovely Monday, beauties! Such a helpful post, Luzanne. I can see you put a lot of thought, research and effort into it. Your commitment and passion for your blog really shows. Luved this post. I don’t experience dry skin myself, but my mum (who is in her fifties now) is experiencing very dry skin at the mo. Even in summer! I am printing this post out for her, she will learn something from this fo sho. I hope this blog post will help your mom with her dry skin – I had very dry skin last year (medication) and it was not a pleasant experience for me. I’m keeping this blog post in mind for when Winter arrives, my skin is normal at the moment but tends to dry out in autumn and winter. Yes, my skin is combo but it changes quite drastically when Winter arrives. Im currently visiting family in New York and let me tell you, it is fr-eeezing here! Especially since Im used to the southern hemisphere weather. This is my first time commenting on your blog, even though I have been following your blog for a while now. I just wanted to say thank you for writing such wonderful posts. You have a way of transforming important information into a language anyone can understand (and making it fun to read at the same time). You have a gift, Luzanne. More so than most of the other bloggers in South Africa. You have no idea how much what your just wrote here means to me, Jenna. I appreciate every single comment I get, I love hearing from you guys! You are so good at these Luzanne! You truly are amazing and your passion shines through. You have no idea how much I enjoy reading your blog. It’s such an easy, fun read. You are a true inspiration and I definitely look up to you and your blog! Thank you so much for your kind and super sweet words, you make my blush.